What are we to make of the speed with which the new climate of national solidarity emerged after September 11? Does it not look strange against a backdrop of the much-touted divisiveness of American life? In truth, The Fractious Nation? makes clear, the contrast of the time of divisiveness before and the time of unity that followed is much too stark, indeed. Less than a year before two planes slammed into the World Trade Center, the 2000 presidential election produced not just the starkly blue and red electoral map but also the two tribal Americas those totemic colors emblazoned. And from the cultural wars to immigration restriction, from the Christian right to political correctness, recent decades have witnessed much hand-wringing on the left and the right about the fragmentation of American life. The Fractious Nation? enlists the critical intelligence of fourteen distinguished contributors who illuminate the schisms in American life and the often volatile debates they have inspired in the realms of culture, ethnic and racial pluralism, and political life. The collective wisdom of The Fractious Nation? suggests a counterview to all the overheated rhetoric. The authors warn against fixating on flamboyant incidents of racial conflict when black-and-white values overlap considerably. On a range of cultural issues, the gap between our citizens has closed as well. And even as the rivalry between liberalism and conservatism transmutes into new forms, the political center remains vital and democratic. We are tied together not just by shared values but by institutions—the Constitution, the culture of consumption, the etiquette of ethnic respect. In private life and public affairs, our nation has expanded the meaning of democratic citizenship. Still, there's no room for self-congratulations here. Tendencies toward preoccupation with private life encourage indifference to the suffering of the less privileged. This is also one of the main failings of the narrative of fragmentation: In its focus on matters of shared values, it too distracts from issues of poverty and inequality that also fragment the human spirit. Jonathan Rieder is Professor and Chair in the Department of Sociology at Barnard College, Columbia University. Stephen Steinlight is a former Director of National Affairs and Director of Publications for the American Jewish Committee. Less than a year before two planes slammed into the World Trade Center, the 2000 presidential election produced not just the blue-and-red electoral map but also revealed the fractured nation that those totemic colors represent. And from the cultural wars to immigration restriction, from the Christian right to political correctness, recent decades have witnessed much hand-wringing on the left and the right about the fragmentation of American life. The Fractious Nation? 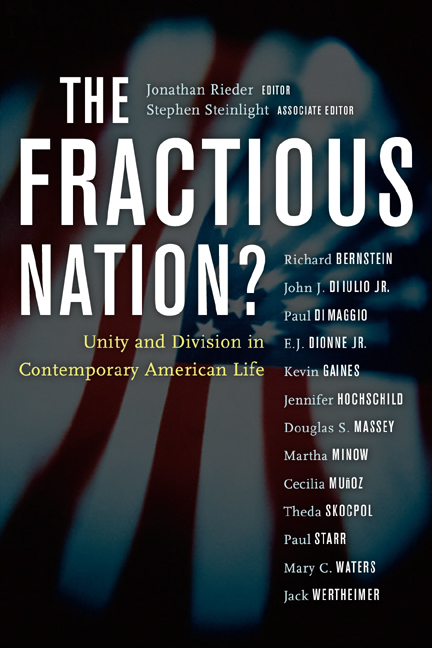 enlists the critical intelligence of fourteen distinguished contributors who illuminate the schisms in American life and the often volatile debates they have inspired in the realms of culture, ethnic and racial pluralism, and political life.